Nothing too exciting to blog about this week! In between work and my busy schedule I’m trying to soak up as many sunrays as I can now that it’s actually springtime outside! And with the sunny, spring weather comes wildlife. One of my favourite things about living in the country is seeing all kinds of different wildlife right in my backyard! Usually I see the standard birds like, humming birds, orioles, cardinals, blue jays, goldfinches, and grosbeaks, plus a couple of bunnies, deer and blue herons, but this year we have another addition to my wildlife repertoire. 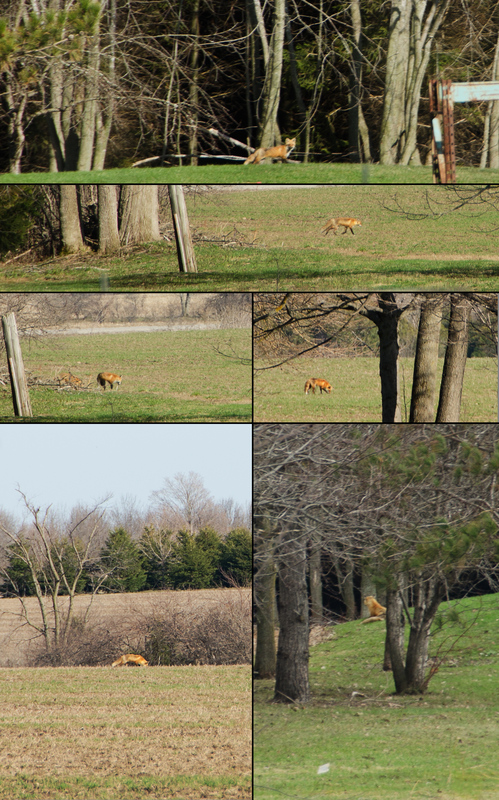 This year we have a couple of foxes playing around in our backyard. At first we thought they were just passing through but we’ve seen them more and more lately so I wonder if they maybe have den nearby! So far I’ve only gotten some glimpses of them, but I’ve put together a collage of sorts of my shots I have where I’ve captured them in my backyard. Next week I am going to New York so I probably won’t be blogging then, but stay tuned the week after for photos that I take while in New York! !